At the reading of their mother Nawal's will, twin siblings Simon and Jeanne learn for the first time that they have a brother and that their father, whom they thought was dead, is in fact alive. Their mother's last wishes send Jeanne and Simon on an expedition in search of their tangled roots. Shifting back and forth in time, Incendies follows two parallel journeys – the twins' and Nawal's own life-changing search to find her son during a time of civil war and sectarian conflict. Through the juxtaposition of these two quests, director Denis Villeneuve crafts a powerful story of deep-rooted hatred, never-ending wars and enduring love, masterfully adapted from the acclaimed play by Wajdi Mouawad. Incendies has won a number of international awards, including Best Canadian Feature Film at both the Toronto and Vancouver International Film Festivals, and Best Director at the Warsaw International Film Festival. It also landed seven Genie Awards (Academy of Canadian Cinema and TV), including Best Film, Best Director, Best Leading Actress, Best Cinematography and Best Adapted Screenplay, and was Oscar nominated this year for Best Foreign Language Film of the Year. 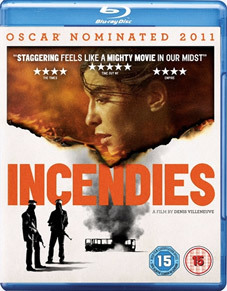 Incendies will be released on UK DVD and Blu-ray on 12th September 2011 by Trinity Film at the RRP of £17.99 for the DVD and £24.99 on Blu-ray.